I am here with another middle of the night crafting session. I grabbed that wonderful little jar of embossing paste. I wanted to enter a couple of challenges, Simon Monday Challenge-Paste and the Card Concept Challenge#4-Use a Floral theme. Ever since taking the Stenciled class over at Online Card Classes, I have been in craft-love with embossing paste. 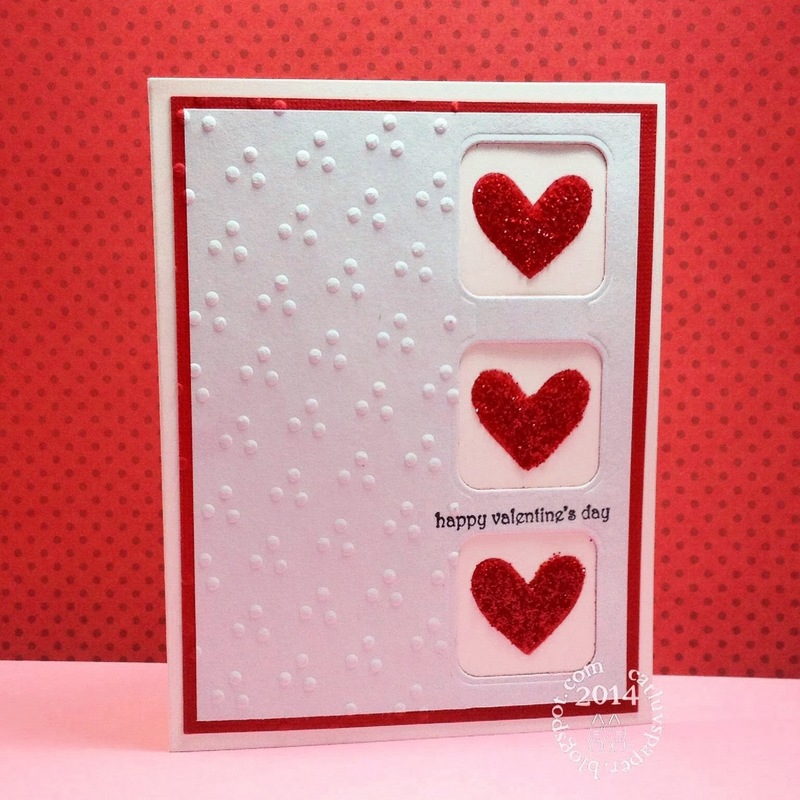 I love the texture it brings to cards, I love the soft gooey feeling of it sliding over the stencil, I love adding color and embossing powder to it. It is just plain FUN! I gathered supplies: Simon Says Stamp set Thinking of you, Hero Arts stencil Large Lotus Pattern, Wendy Vecchi white embossing paste, Stampin Up reinkers in Daffodil Delight and Strawberry Slush, Versamark ink, Hero Arts silver and white embossing powders, and Stampendous clear chunky embossing powder, Neenah aspen white 120# cardstock, foam tape, white Darice 6 mm sequins, and a sheet of paper from the Simon Says Stamp February Card kit. I mixed in a few drops of the two colors to create a coral colored paste which I applied sparingly to the stencil. After removing the stencil I dumped a lot of the chunky clear embossing powder on top of the paste. I let it dry--sort of for about 30 minutes, then I added heat to get a very thick gloss over the paste. Hard to photograph it, but it looks very glossy. I stamped and embossed a sentiment, added the panel to my image and foam mounted them to a white card base. I believe this is a clean and layered card. I quite like the result. Thanks for stopping by. 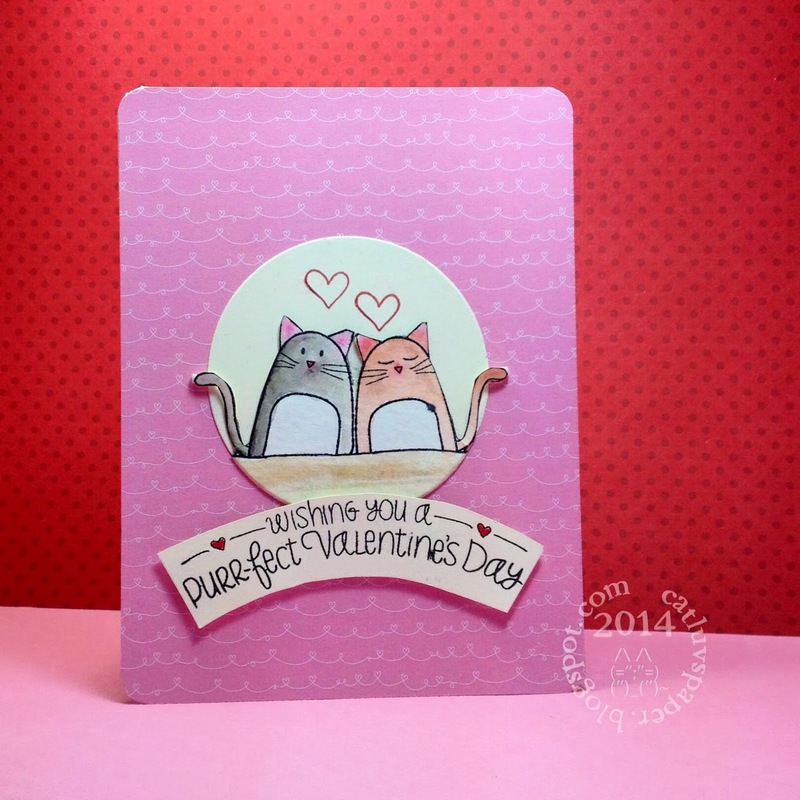 I am still playing with my Simon Says Stamp February card kit. Today as hubs and I came back from lunch another was sitting against the door. I better get busy. I loved the graphic at Fusion, and decided to play along. 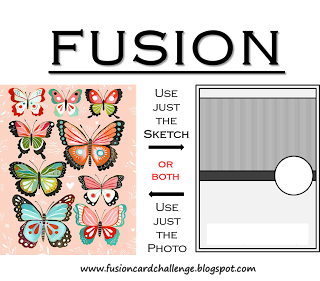 I did blend the two, I loved the black rimmed aqua butterfly and the pinky background. Two of the papers in the kit had interesting patterns that I thought would work well. I punched two Martha Stewart butterflies from scraps of black and teal paper. I intended to layer them, but they looked a bit stark next to one another. So I slipped them through my Xyron and dipped them into some clear rock candy distress glitter. Just the look I wanted. Some silver embossing of two stamps from the Simon Says Stamp Thinking of you set included in the card kit and my card was almost finished. I had it on a white card base, and decided to silver emboss the edges of the card base as well to tie it all together. Thanks for stopping by! Another family birthday, this one for one of my SIL's. Happy Birthday "Sis"! Quickcard79, a photo by Cat Craig on Flickr. Another of my favorite scrambles over at Hero Arts Flickr group ran today. Something new for me...Scraplings for Martha's scramble. Dimensions are 1.5 by 4.25 inches. Amazing to create on such a small space; these took me almost the full 90 minutes to create, photograph and upload. Whew! All stamps are hero arts; buds and stems and petite messages on one, crossword background and tiny serendipity alphabet on the second. The bling and ribbon slide are by stampin up; dotted ribbon is by american crafts. The adorable gingham button is from hot off the press, and the black seam binding by hug snug. Inks used were hero arts red royal, butterbar, field greens and black onyx by versafine. I do love a sketch challenge. Here is my entry for Mojo Monday 333, the sketch is by Julee Tilman. My papers are from Stampin Up, and the card base manufacturer is unknown, I have a pile of these in yellow and orange. The exterior sentiment is Avery Elle - Fanfare. The interior is from the stamps of life. The ink is Versafine's Majestic Blue. Dies were Sizzix circles. 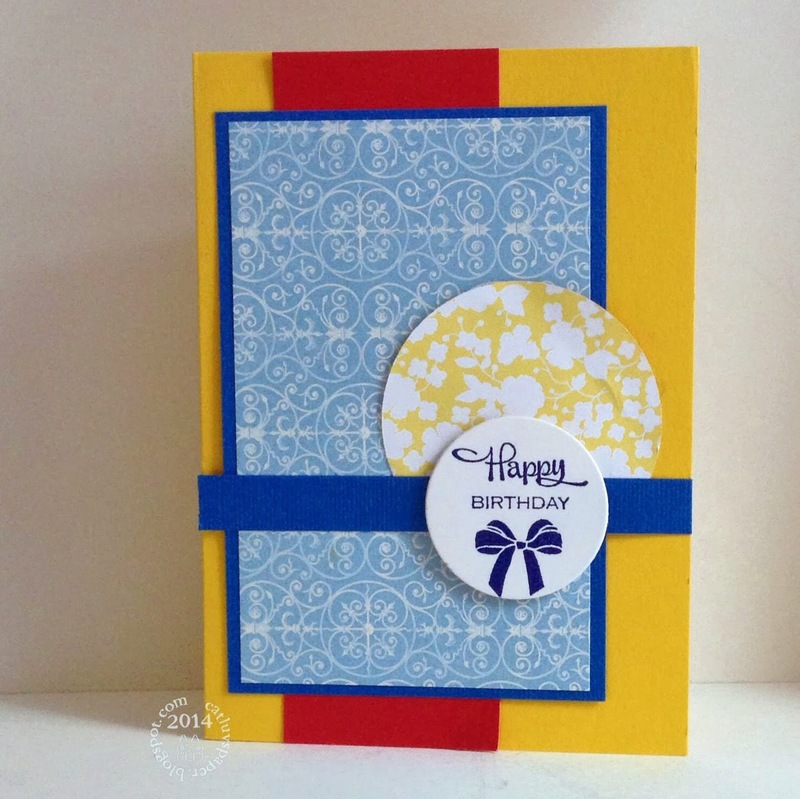 I love bright colors and this makes a cheery birthday card. I decided to use the left over yellow piece as a frame for the interior sentiment. The colors are light enough that a hand written note can be added over the pattern. Thanks for stopping by. A second post today, I am so excited that I am actually playing along with Muse #55, this week. I vote almost every week at Muse; I love seeing everyone creations. Having just gotten over the nasty ick-ness at the end of January and trying to get Valentine Cards made and ready to mail, I was not able to play in challenges much which I really want to concentrate on in 2014. I loved Marion Vagg's card for this week's Muse. I love the rainbows, and the die cut and especially the lay out. I also have an unused Simon Says Stamp February Card kit sitting waiting to be dug into. So I jumped in and grabbed the Candy Necklace card stock by Bazzill, and made it into a top folding card. Two of the very fun patterned papers had that same teal-ish look to them. The pattern on one patterned paper reminded me of Marion's card. I added the Simon Says Stamp Small Hello (stacked several times) die cut as well as a sentiment from their Happy Every Day Stamp set. Some teal dots from Stampin Up and my MUSE inspired card is complete. 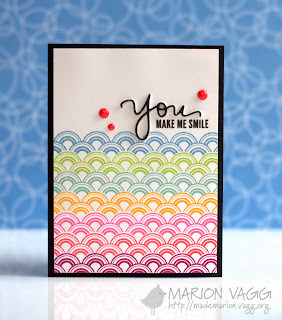 I really love this card, Thanks for the inspiration Marion! Part of my 2014 goals is to participate in more challenges. So far I have not been doing so well. So yesterday, I prepared Hubs letting him know it was a card making day. I prepped lunch and dinner and made brownies while I was downstairs for breakfast. I selected several challenges to play in over the next couple of days. First up is a new to me challenge Retro Sketches. 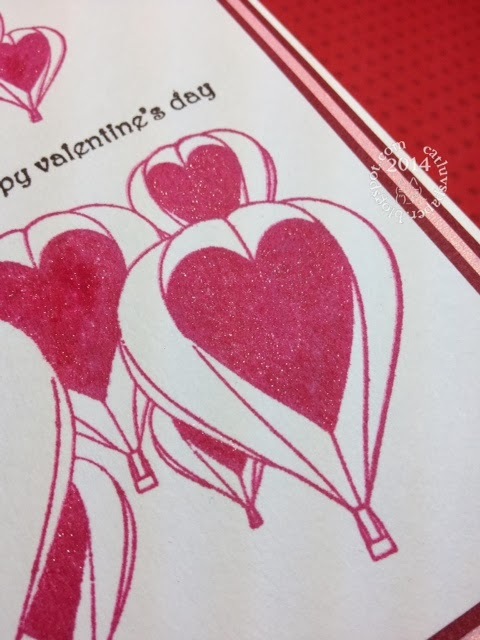 I flipped the heart image in the smaller panel and made it a flower, and I can't help but add a bit of string or ribbon to a card. 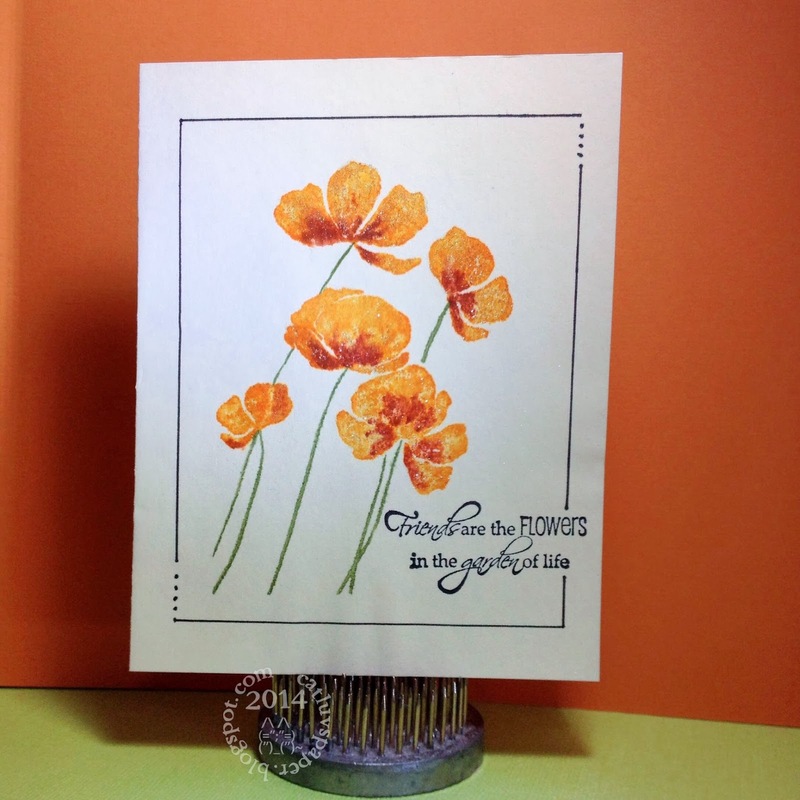 This card is 4.25 by 5.25 inches to accommodate the petal overhang. Materials: Recollections Flowers, Colorbok bling, Techniques Tuesday Sentiment, WRMK string, Hero Arts Embossing Powder, Versamark Ink, Neenah Paper, as well as two scraps, and Modern Mosaic embossing folder by Stampin Up/Sizzix. One of my BIL's is celebrating his birthday today, so this card was sent on its way to him last week. The guy cards are still the tough ones to make; but I was pleased with this one. Happy Birthday Dear Brother! I made this card as a thank you for a recent blog candy win (Thank you Barb). 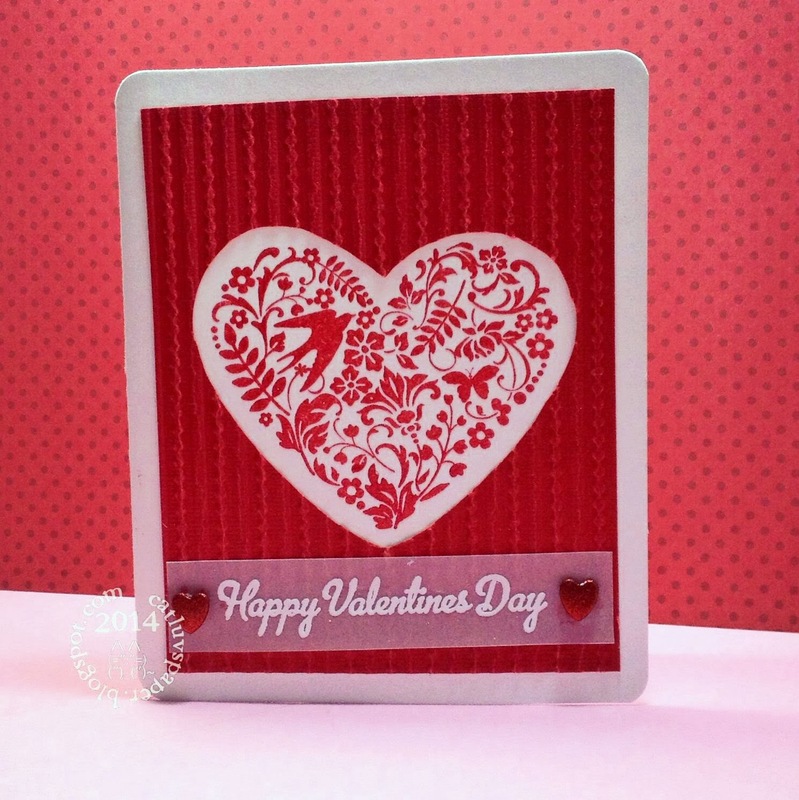 I utilized some of the techniques from the Stenciled class in the construction of this card. 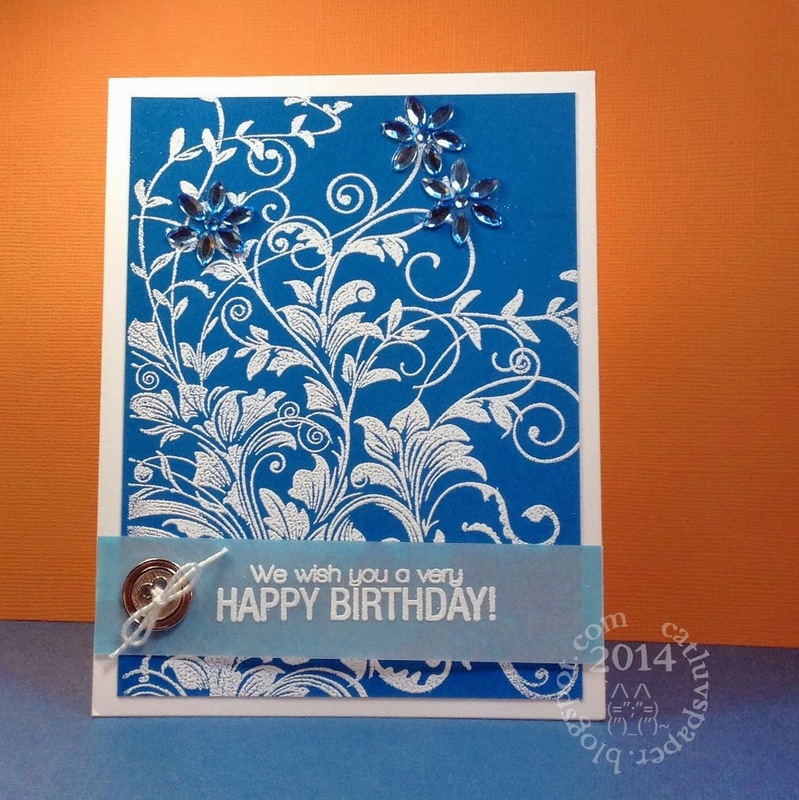 I loved the blues, and the texture provided by the embossing paste with the embossing powder overlay. I have no patience to wait for it to dry completely, so there are always little bumps -- but I love the feel of it under my fingers. Supplies: Kite Stencil, Vellum, Stampin Up Sentiment, Gems (colored with Copics), Ribbon by American Crafts, Cuttlebug Embossing Folder. One more Valentine to share. Hubs really dislikes pink, but on Valentines Day I can get away with it. Besides, I have another Valentine for him, and its manly. The stamp set is from Simon Says Stamp. I made quite I few Valentine's this year, not as many as years past but it felt like a whole bunch because they were all different cards as opposed to the same card 15 times. Below is a recap, and the lovely bouquet hubs gave me early, in case the weather impacted our Valentine's plans. Have a wonderful Valentines Day, and thanks for stopping by. This bit of pink and glittery goodness was so much fun to make. It all started with that circle scrap in the center. 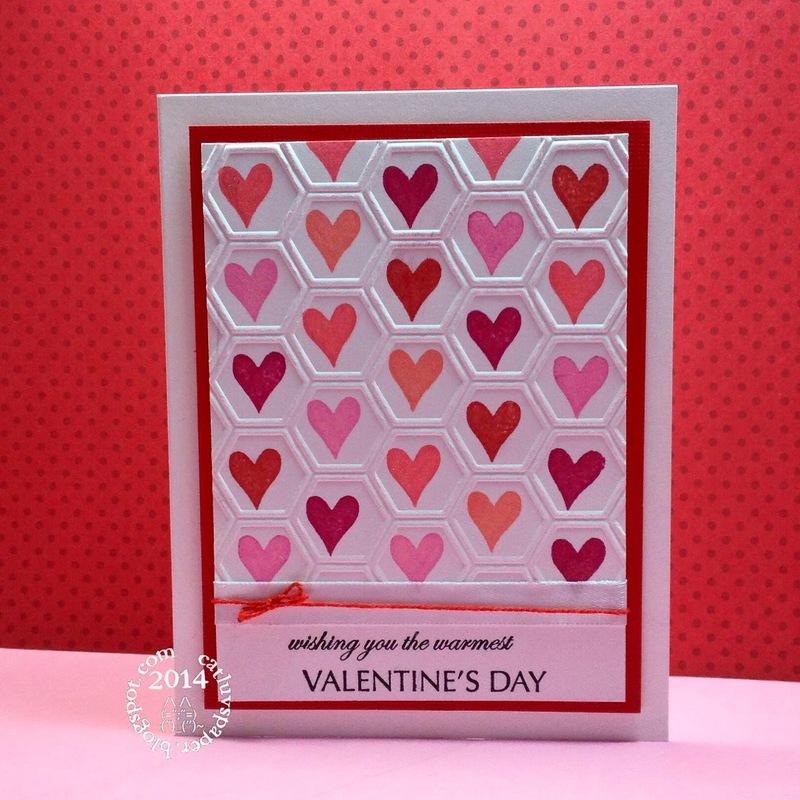 I found it to be a perfect fit for the center of a Spellbinder Die with hearts around it. I cut 3 hearts from memory box's precious hearts, lopped the bows off of two of them. I ran them through my little Xyron sticker maker and then dumped Distress Glitter in clear rock candy over them. Wow love that look. Next I decided the bigger circle need to sparkle too. I used some Be Creative adhesive sheet on white card, cut the die, then peeled back the liner paper from the die cut and dunked it into the glitter. 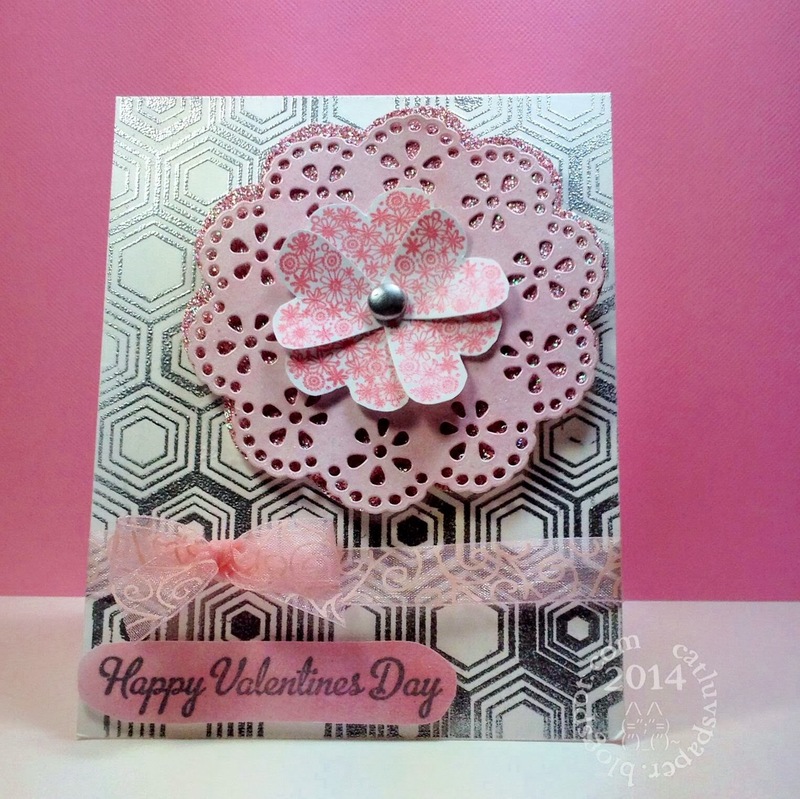 A piece of pink AC Cardstock was dry embossed with a Cuttlebug swiss dot embossing folder. To cover my almost but not quite seamless joining of the three hearts, I used a glittered pink heart brad. I couldn't bear to put a sentiment on the front, so that is going on the inside. I am entering this in a new to me challenge, the card concept. 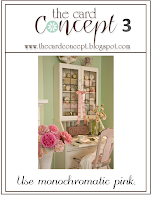 Challenge #3 is Monochromatic pink. The style on this card is either clean and layered or classy and elegant. I'm still a bit new to the styles and haven't quite found mine yet. They have the styles defined at their blog, it makes for informative reading. Below is a close up of the glittered bits. I was browsing the Flickr groups and noticed the Love!-Handmade Cards, ATC's and other Crafts group was having a Valentine exchange. I immediately signed up for it. 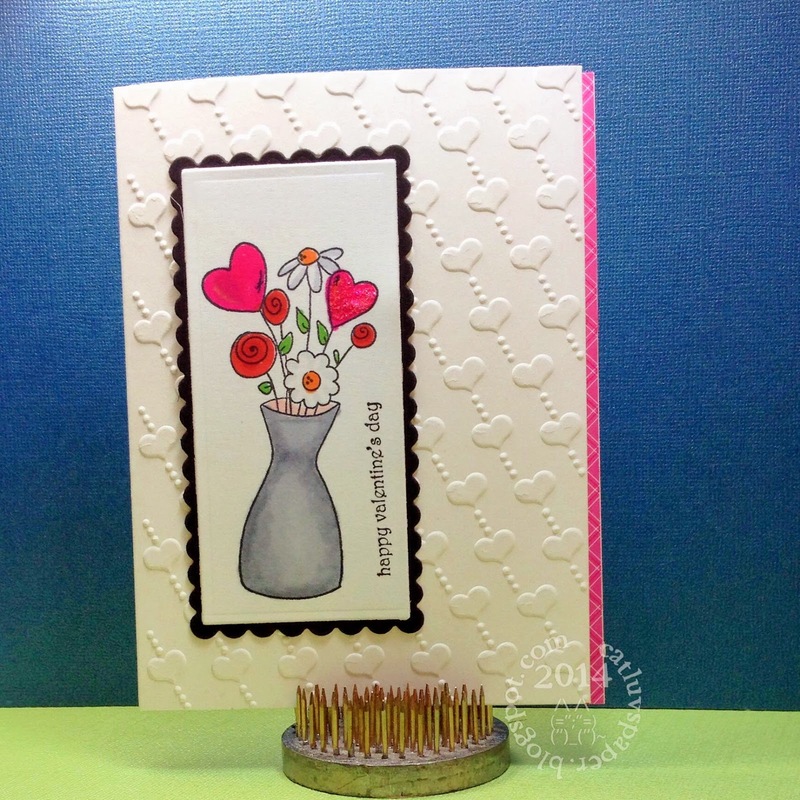 One of the first stamps I purchased was this cutie from Whipper Snapper Designs -Valentine Bouquet. It is fun to color and not super difficult. I used Spectrum Noir markers IG1, IG2, IG4, FS6, BP3, CG4, CR8, DR2 and OR1. I cut the image using a Spellbinder Die-Long Classic Retangles, matted it with another Spellbinder Die-Scalloped Long Classic Rectangles. The sentiment is from Stampin Up Teeny Tiny Wishes. 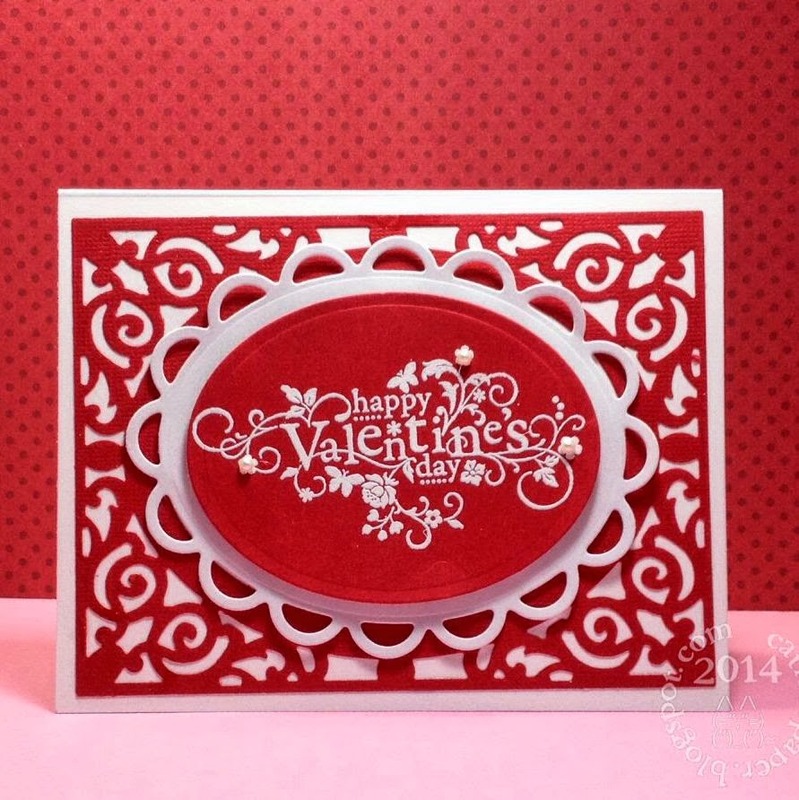 The card front was dry embossed with Darice's Heart Background folder. 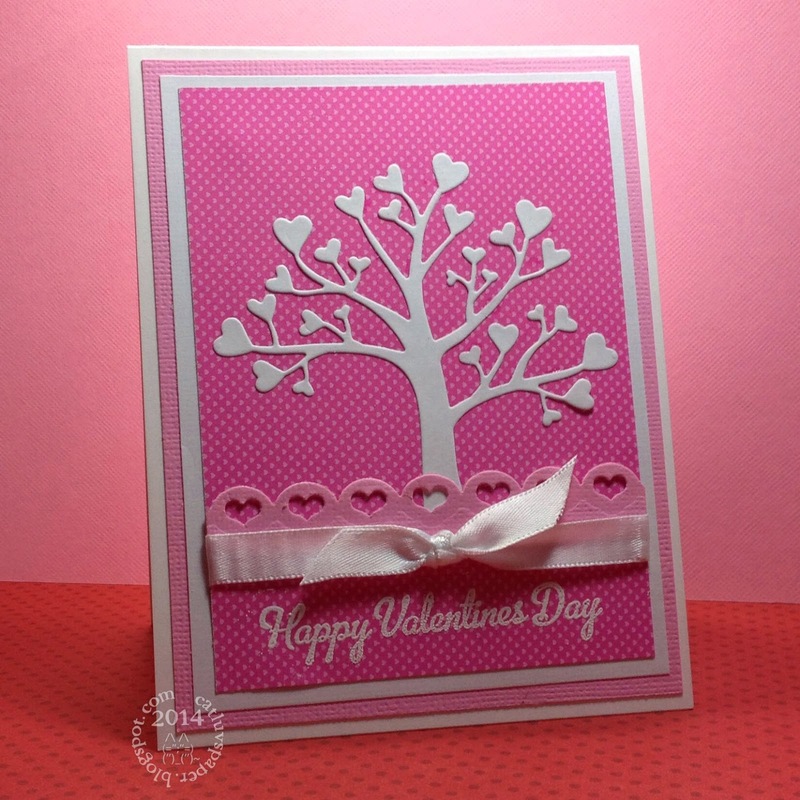 The card front was trimmed a bit to show just a tad of a pink strip of paper from Doodlebugs Sweetheart collection. The smaller heart flower was topped off with Glam Pink Stickles. I love this little Valentine. You can see all the posted cards here. 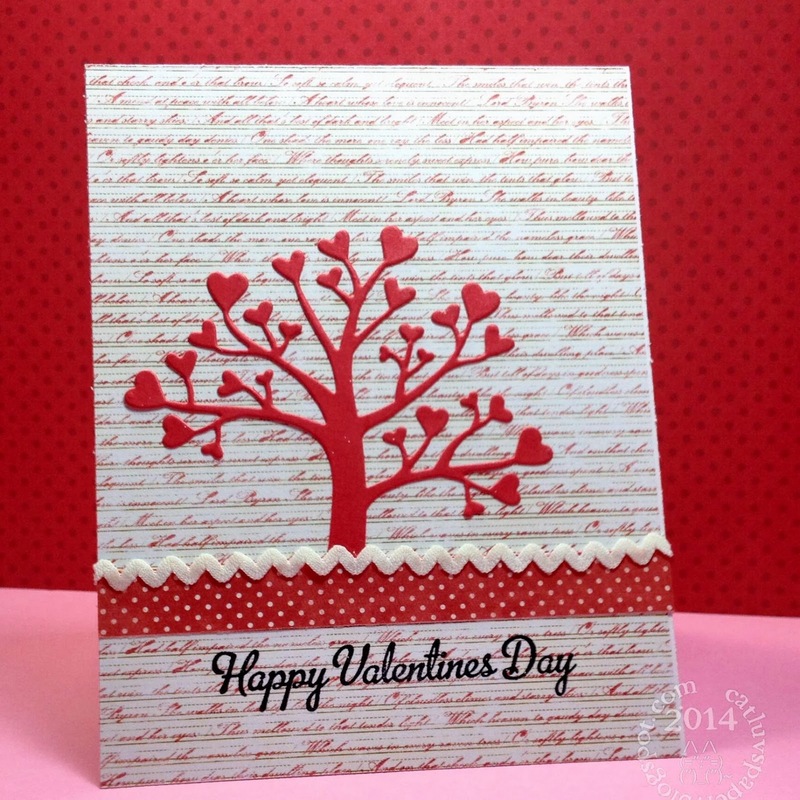 Once more with the Stampin Up set You are loved (retired). 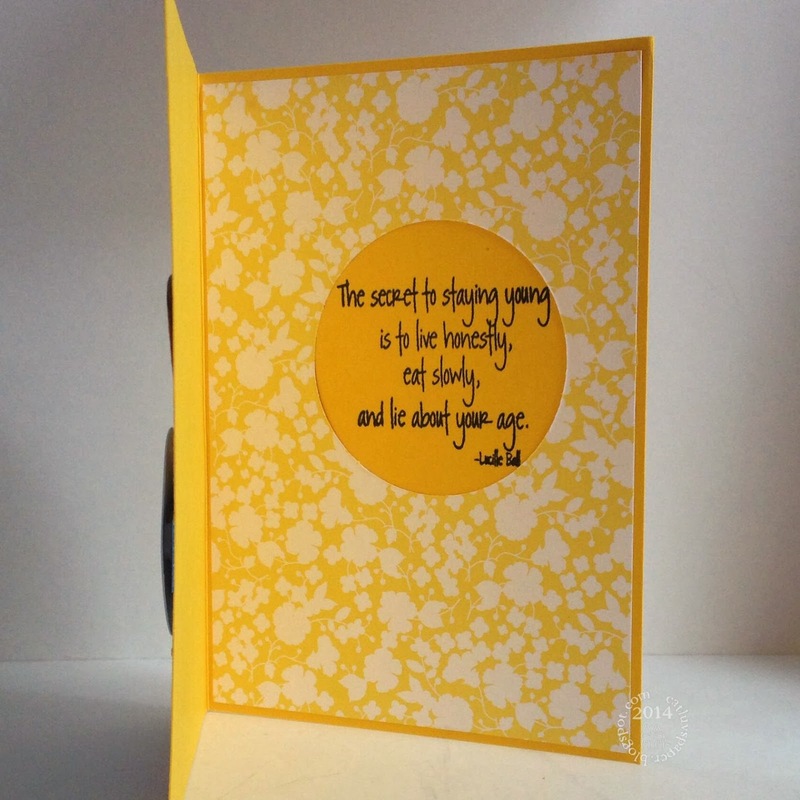 This sentiment image fit perfectly into an oval shape and I thought it would make a lovely focal point for this card. All dies used are Spellbinders, White embossing powder from Hero Arts, pearls from Stampin Up, papers Stampin Up as well. I picked up this Heart Tree die from Taylored Expressions while hubs and I visited Ohio at Thanksgiving. I cut two out while deciding on a card. I ended up using them both. Today its a two-fer. Supplies: Patterned paper by Authentique - 6x6 Smitten pad, Martha Stewart ric rac trim, Craft Smart sentiment stamp. Cardstock by Stampin Up. I am entering this one in the Shopping Our Stash's Love Me Tender challenge. 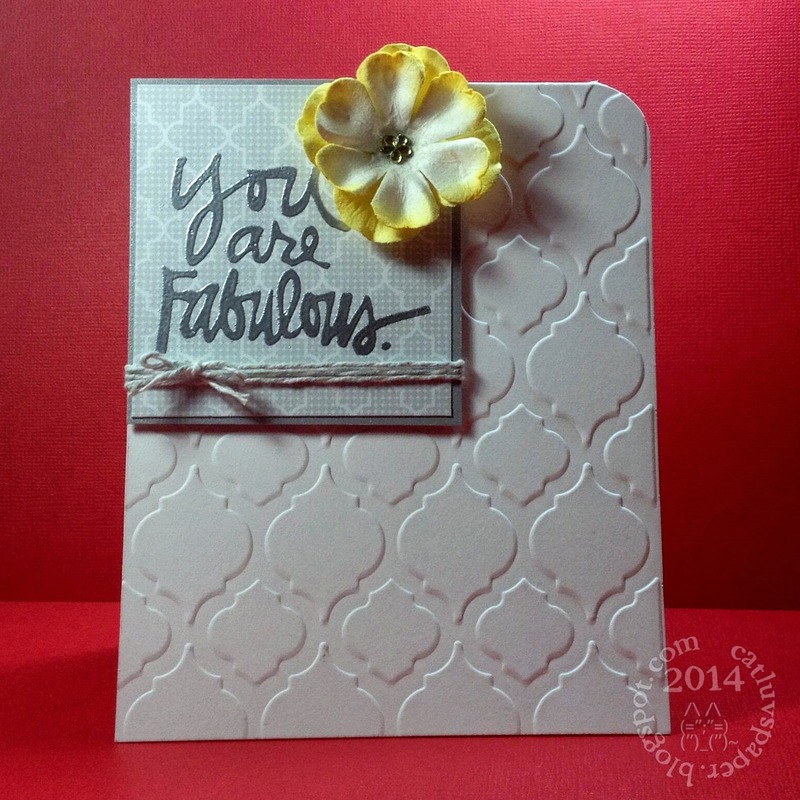 Supplies: Patterned Paper by Doodlebug 6x6 Sweetheart Pad, Spellbinders edge die, versamark and white Hero Arts embossing powder, Celebrate Ribbon, papers by Recollections. 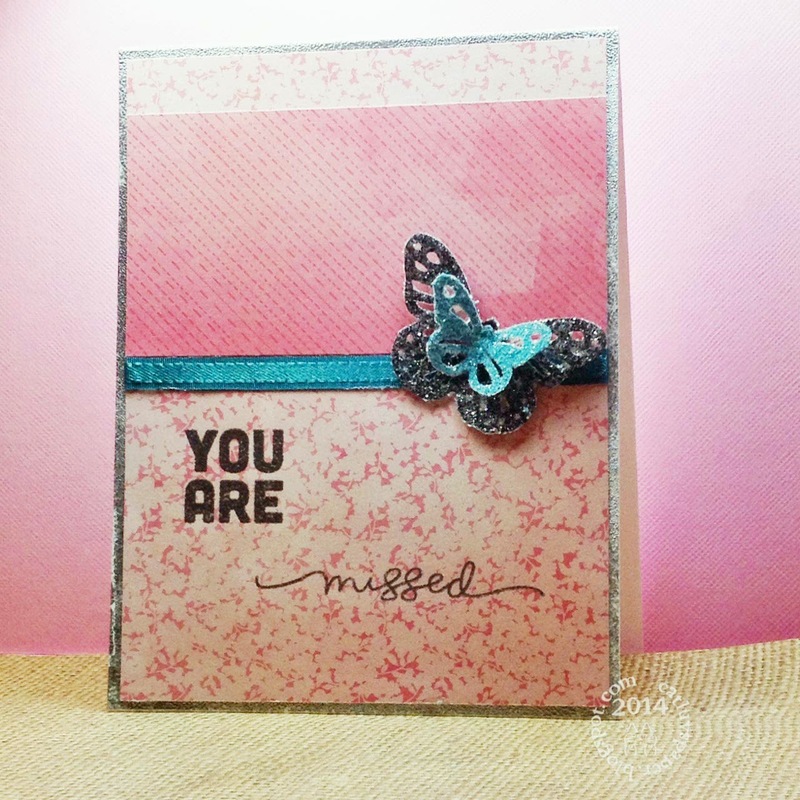 Craft Smart sentiment stamp. I think it fits the clean and layered definition. I am entering this in a new to me challenge, the card concept. Challenge #3 is Monochromatic pink. Here is the challenge graphic. Yesterday I played in Barb Engler's Scramble over at the Hero Arts Flickr group. I love scrambling with these uber talented ladies. 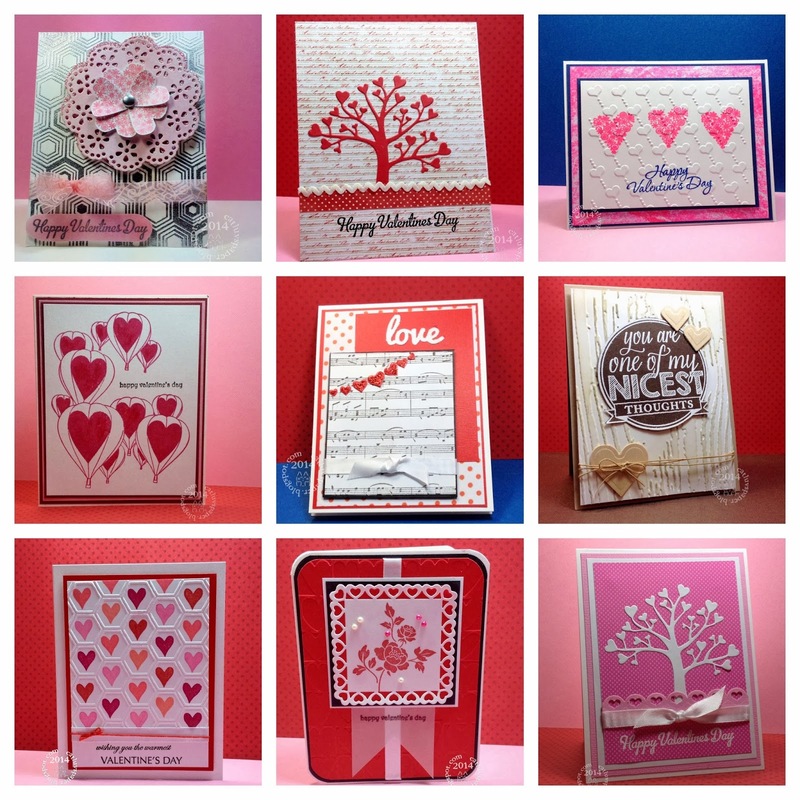 Barb required the following items in our card creation: Pink, Heart, Silver and of course a Hero Arts stamp that was more than just a sentiment (easy to do they have such a wonderful selection and my collection is taking up a box and 2 bins). It took me about 80 of the 90 allowed minutes to make my card, photograph it and upload it. I had trouble with the sentiment and I did far too much heat embossing for a scramble, not to mention the fussy cutting which I detest! 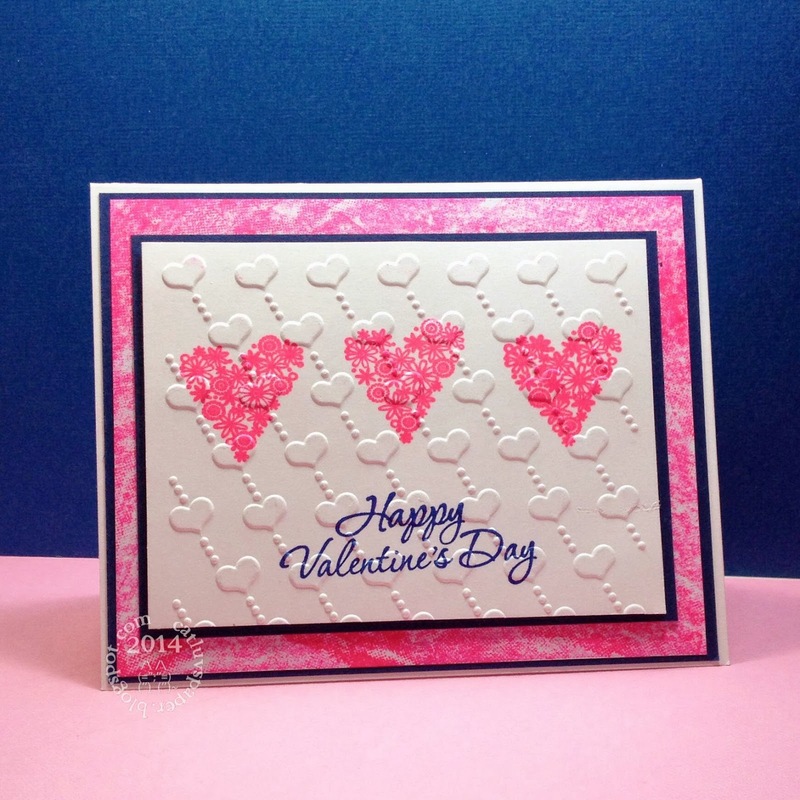 I stamped 5 floral hearts from the Hero Arts Set LP269 in Pearlescent Coral and heat embossed them with clear powder. Then cut them out. Next I punched a small circle and layered the hearts around it to create a flower. A sliver brad was placed in the middle. Next I inked a white doily with Memento Angel Pink ink and heat embossed that. The doily had a slick surface so the ink wasn't sticking well. It was fine after the heat embossing. My card base was silver heat embossed Hero Arts Hexagon Background. This just seems like such a masculine stamp, but I love the mix with the girly flower and pinkness. 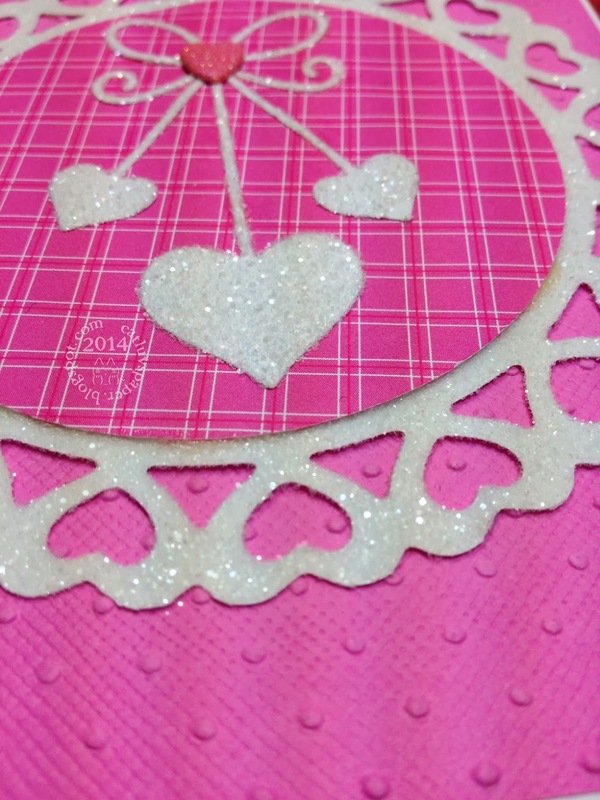 I wanted a bit more punch so I layed the doily on a piece of scrap glittered cardstock (again with the fussy cutting...) My sentiment was silver Hero Arts ink on a pink inked scrap of white and then whole thing heat embossed with clear powder. I plopped that flower piece in the midlde and offset the sentiment, looked at the clock and panicked... 75 minutes gone...I quickly photographed it , uploaded and posted to the group. I moved the flower piece, and added a sweet patterned organza ribbon in a soft pink shade. Now I feel it is more balanced, and I love the result. Now it can go on its journey to its recipient! Which one do you think looks more pleasing? 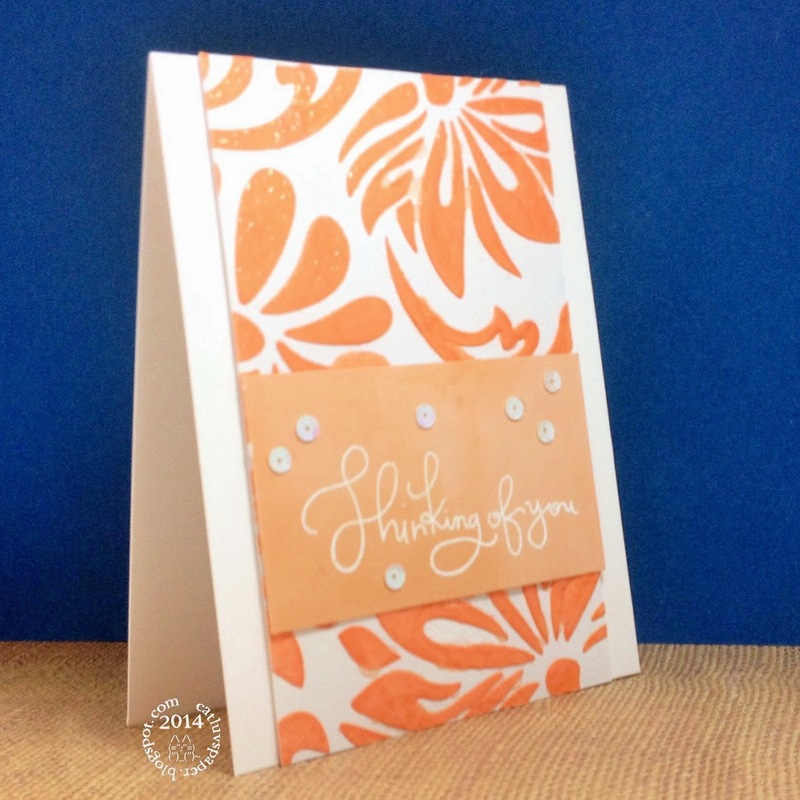 I started with a Sizzix Honeycomb embossing folder and a wonderful stamp by Memory box. It is primarily a sentiment stamp, but it also has a small heart on one of the ends. 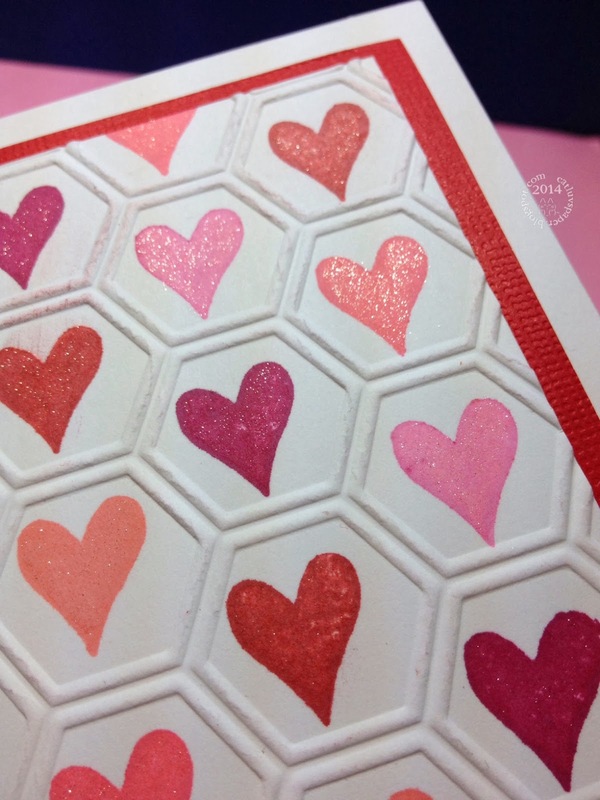 I grabbed several of my Hero Arts Shadow Ink pads and randomly stamped hearts inside the hexagon spaces. I stamped the sentiment, then added some ribbon and string and matted the whole thing with red cardstock then placed it on a white card base. It needed just a little something and of course the wink of stella clear brush pen came to mind. A close up is below. I absolutely adore that wink of stella clear brush pen. Its so handy for that extra little bit. I am entering this in the Simon Wednesday Challenge- Have a Heart. I bought the Stampin Up You are Loved stamp set last year and was sorry to see it retired. I used it again this year. The main floral heart image is showcased in this card. 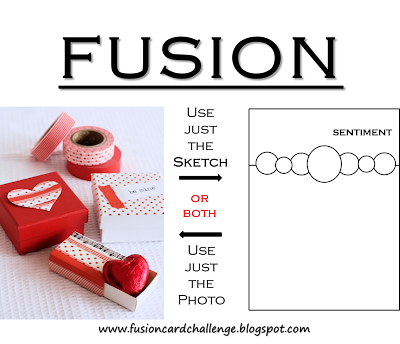 I used the Sizzix Beaded Ribbon embossing folder on a red panel with the heart shape cut out (I traced the stamp to get the sizing.) The sentiment stamp is from Craft Smart, White Hero Arts Embossing powder was used over Versamark ink on a scrap of Vellum. The main image was stamped in Memento Luxe ink in Love Letter then clear embossed. The two heart brads are from an little collection of sparkly hearts I have. I don't know why I picked up that neon pink Hero Arts ink pad when I started this card, but I love the bright happiness of the colors. 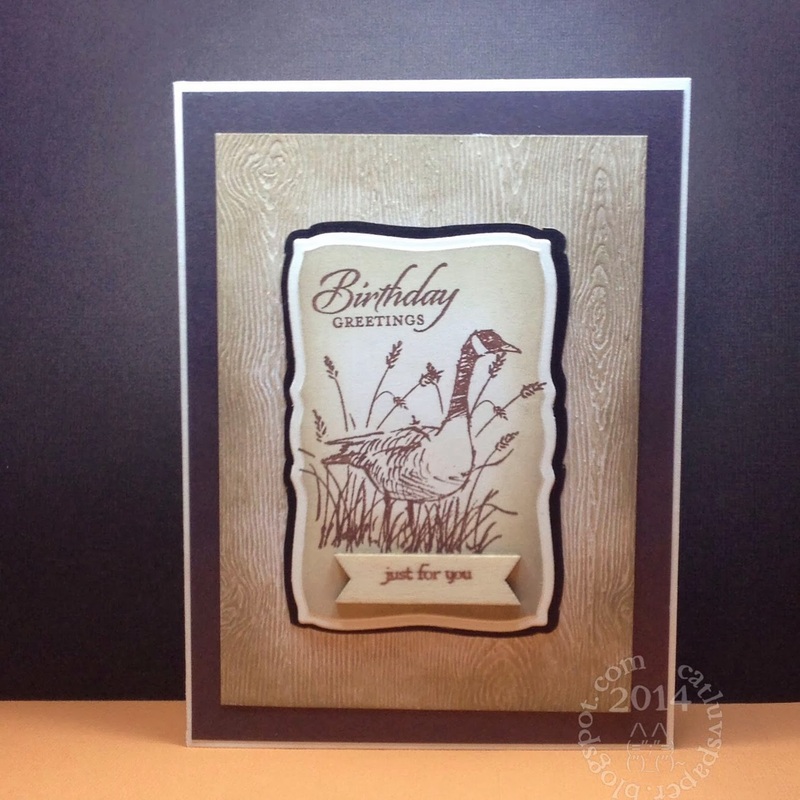 I used the Hero Arts Brushstroke stamp set to create the patterned paper. I used the squarish stamp of brushstrokes back and forth to add color to white paper. I liked the effect. 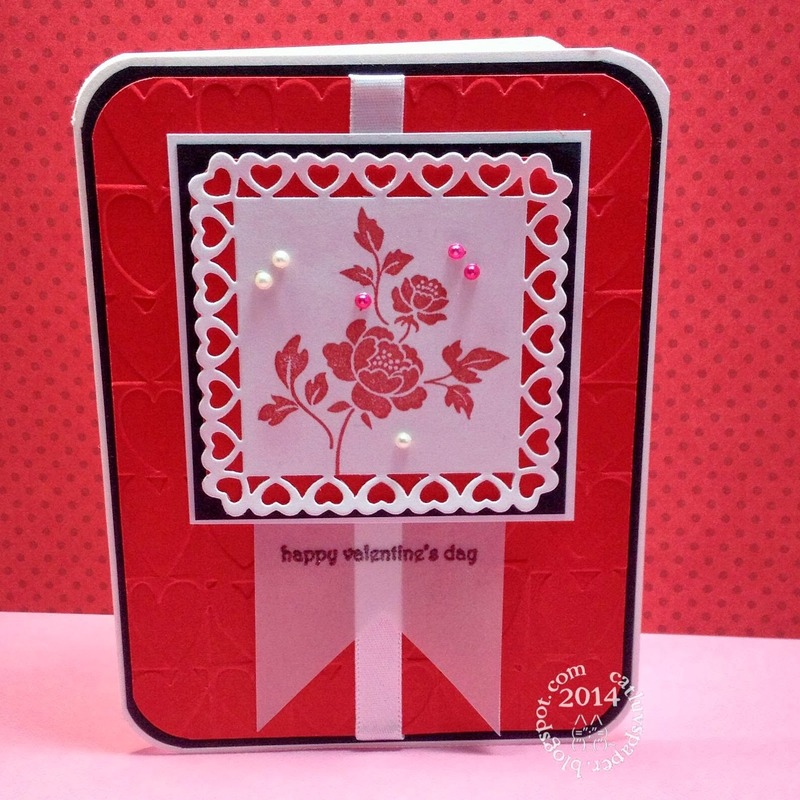 I used a Darice Falling hearts embossing folder on the front panel after stamping the hearts and sentiment. I matted in navy blue and I really like this combination of colors. 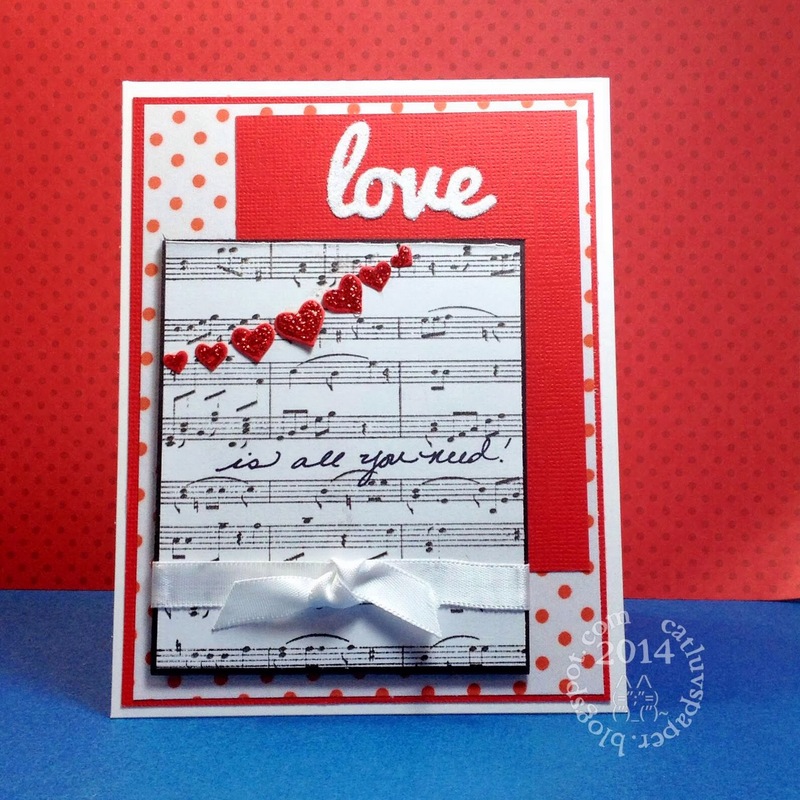 The heart stamps and sentiment are from Hero Arts LP269. The blue ink is Versafine Majestic blue. I kinda really love this one, mostly because of the texture of the glitter hearts. Glitter...whats not to love---especially when it is distress glitter in Festive Berries. Papers by Stampin Up, Sentiment by Stampin Up, die by Simon Says Stamp, Heart Stamp -Simon Says Stamp Square Sayings, Love Letter ink by Memento Luxe, Onyx Black Ink by Versafine, Glossy Accents, Distress Glitter-Festive Berries, and Sizzix embossing folder. 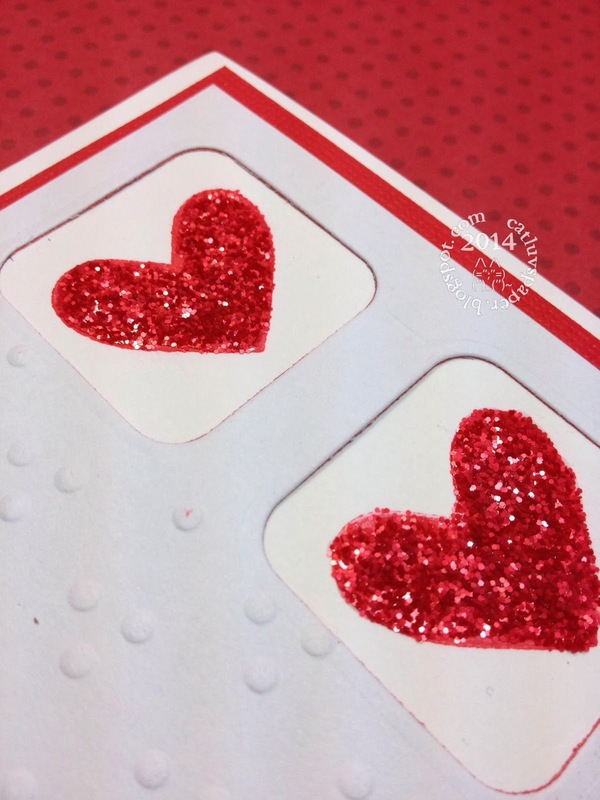 Those hearts are so lush and thick with glitter, below is a close up. Edited to add-Adding this to the Simon Wednesday Challenge - Have a Heart. I am pretty sure this is my first time joining the fusion challenge. I have been following it since it began, but never dipped my toes in this challenge pool. The challenge this week is kinda awesome. Lots of red and heart goodness; and polka dots...yea! I took a bit from both the sketch and the photo. I strung 7 hearts across my music background, topped them with stickles for some shine, and what sentiment could be better than Love covered with Rock Candy distress glitter! The music stamp is from My Favorite Things, the hearts are a Simon Says Stamp die, the love die is from Taylored Expressions. The ribbon and papers are all scraps from the valentines I have been making. P.S. I've added a page with the badges of challenges I am enjoying. Links to the blog homepage are there as well. Check it out, some might be new to you. Valentines are the cards being posted until mid February I hope you enjoy. 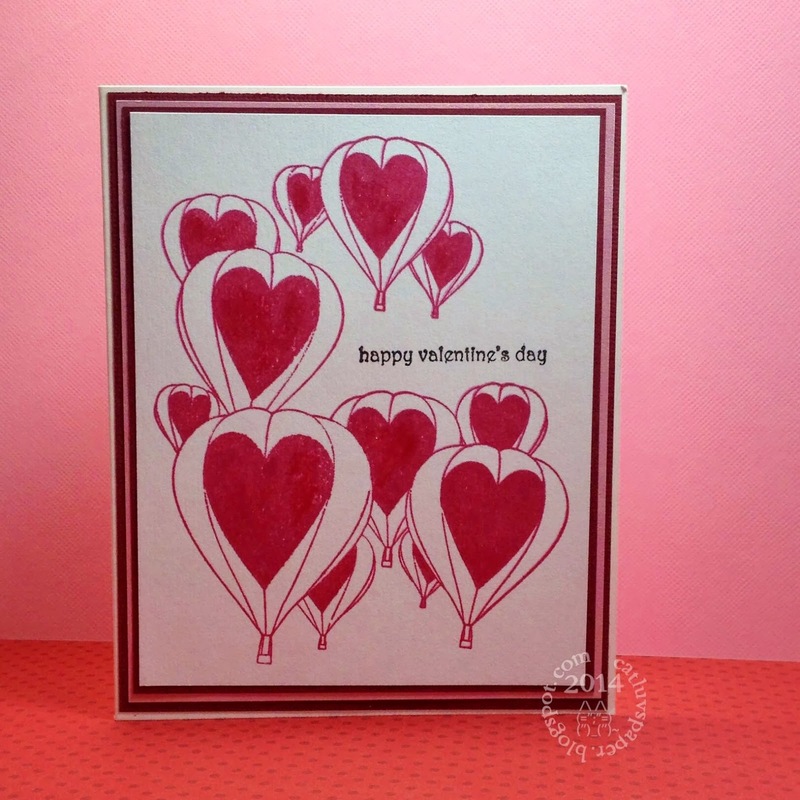 This card was made with Spellbinders heart square die, Stampin Up's You Are Loved stamp set(retired), papers and pearls; Ink by Hero Arts-Red Royal and Versafine Black Onyx; Cuttlebug Heart Blocks embossing folder, Vellum by Core d'nations. Valentine's Day is going to be here very soon. 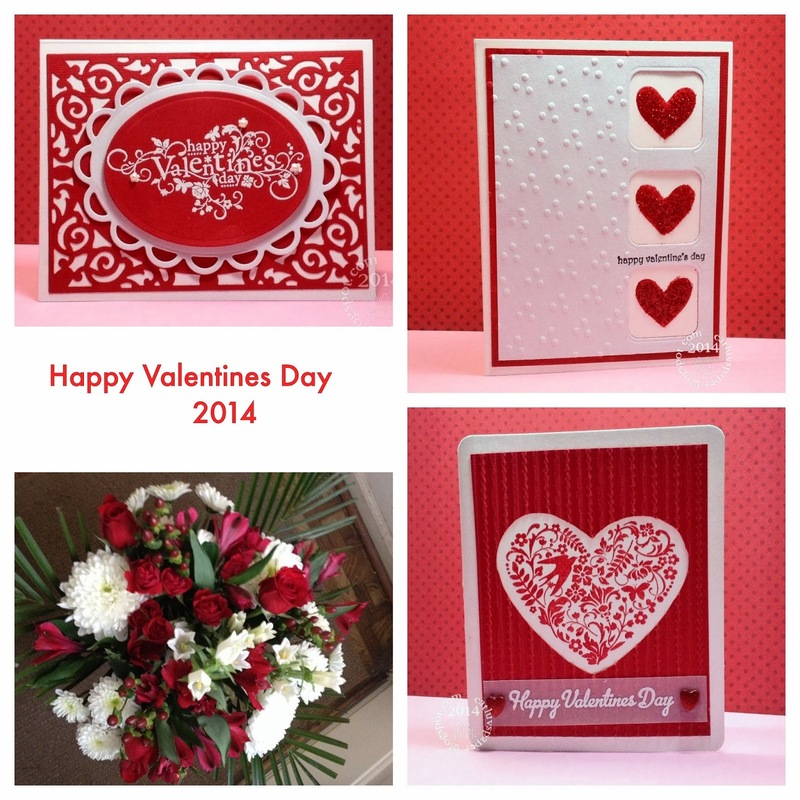 Hubs and I have a road trip planed to Loveville, MD to mail our Valentine cards out. They have a sweet Valentine message for mail posted from this tiny out of the way postal trailer. We discovered it last year, and even sent a valentine to ourselves to see the marking. That means I need to have all my Valentine cards finished this week. I have been working on them every evening. I usually make one and duplicate it for all I am sending out. This year I am making several different Valentines. From today until Valentines I will be posting the cards. Prepare for a flood of Hearts, Flowers, Red and Pinky goodness! I picked up this stamp last year on a road trip searching for a scrapbook store inside a mill. It was in the discount pile and looked sweet. Some minor surgery was done to insure the stamp fit on an A2 card...2 small floating balloons were removed from the stamp. It fits much better now. Papers were from Recollections, Raspberry Jam Ink from Hero Arts, Sentiment Stampin Up, and the main image stamp from Penny Black. It was a bit plain so I added some wink of stella to the hearts. Close-up below. I love that bit of shine! Thanks for stopping by, and come back tomorrow for more Valentine's. I am so glad that Deborah Nolan has brought back the Card Chain Challenge. 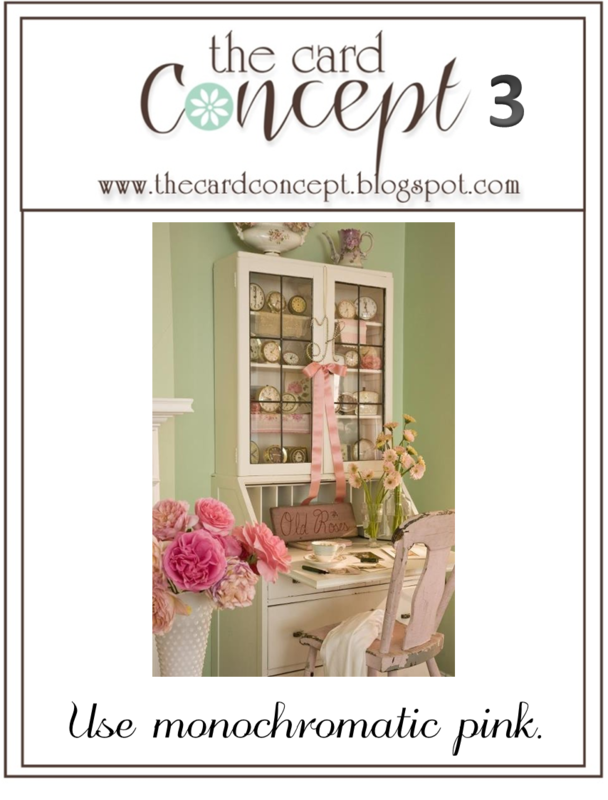 She provides several prompts - colors, sketches, topic, and embellishment; you can pick and chose which to use. Sign up is easy using Mr Linky, and you simply send a card to the person you signed up after. Contact information is provided via email after the linking has closed. This month I went with Friendship. I had picked up this watercolor stamp while in California. It is from Rubbernecker Stamps. I inked it with Spiced Marigold distress ink, as well as Fired Brick and Peeled Paint distress markers. Then spritzed it with water before stamping the two parts on my card front. Next I stamped the sentiment with Onyx Black Versafine ink. To finish the card, I drew a line and some dots around the image. The entire card face was spritzed with some Ice Glaze Radiant Rain from Luminarte and the flowers were brushed with Wink of Stella for an additional bit of glitz. The sparklies don't photograph well for me, but it looks really pretty in person.